Fanta Wants You To Taste Fanta – By Eating the Print Ad About How Fanta Tastes! Then they offer you a chance to taste it. Nope…we’re in the ‘future’ now, kids. Fanta is asking people to actually eat the print ad which has been created solely for that purpose. Posted in Advertisements, Food, Future, Weird Ads | Comments Off on Fanta Wants You To Taste Fanta – By Eating the Print Ad About How Fanta Tastes! Sometimes towns and even countries have to stretch to lure potential tourist dollars. Occasionally the only thing are some strange promises of something unique about a particular area. We’ve all seen photos of the Giant Ball of (insert something you might make a giant ball out of). You might be surprised just how many will actually drive out to seek these over-the-top and almost accidental attractions. To celebrate the ‘Year of Natural Scotland 2013’, the ‘Visit Scotland’ website has created something that might possibly cause peoples’ heads to explode in a ball of confetti, sparkles and female anime character giggles. They’ve taken one adorable thing and one questionable fashion choice of Scottish heritage and combined them into a nexus of weirdly cute by dressing two ponies, Vitamin and Fivla…. Most local websites that often state: ‘Come See the Town of _______ where you can sit for hours and see local squirrels bury their nuts or sit by the lake for hours on end while wondering about other towns where something exciting might be happening’ just never seem to help garner enough buzz for you to even consider visiting. 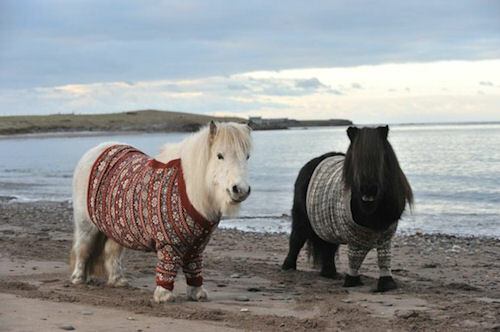 But…two adorable ponies made even more adorable because they’re wearing sweaters? We think people might notice. You are currently browsing the archives for the Weird Ads category.